Dec 4-8, 2016 IEEE Globecom Workshop “Ultra-Reliable Low-Latency Communications in Wireless Networks”, Washington DC, USA. Dec 4, 2016 Eduard Jorswieck: “Energy‐Neutral System‐Level Analysis and Optimization of 5G Networks”, Tutorial, IEEE GLOBECOM 2016, Washington DC, USA. Nov 9, 2016 Gerhard Fettweis: “5te Generation Mobilfunk: Wo Funk und Automatisierung zusammenwachsen”, Phoenix Contact Planerforum, Schieder-Schwalenberg, Germany. Sept 24, 2016 Frank Fitzek: “5G – ein Netz zum Anfassen”, Aachen 2025, Themenpark Kommunizieren. Sept 20-23, 2016 Eduard Jorswieck: “Energy-Neutral System-Level Analysis and Optimization of 5G Wireless Networks”, Tutorial, ISWCS 2016, Poznan, Poland. Sept 20, 2016 Gerhard Fettweis: Panelist “Edge Computing as a Key Enabler for 5G”, Mobile Edge Computing Conference, Munich, Germany. Sept 14, 2016 Gerhard Fettweis: Keynote on “5G and the future of IoT”, ESSCIRC 2016, Lausanne, Switzerland. Sept 13, 2016 Gerhard Fettweis: “Physical Layer Challenges When Designing the Tactile Internet”, 2016 Tyrrhenian International Workshop on Digital Communications (TIW16), Livorno, Italy. Sept 12, 2016 Gerhard Fettweis: “5G: Revolution im Mobilfunk durch das Taktile Internet”, GDNÄ-Versammlung, Greifswald, Germany. May 27, 2016 Frank Fitzek, Muriel Medard: Tutorial “Network Coding: From Theory to Practice,” IEEE ICC 2016, Kuala Lumpur, Malaysia. May 10-13, 2016 Frank Fitzek: Keynote “5G enabling the Tactile Internet”, MMSYS 2016, Klagenfurt, Österreich. Apr 22, 2016 Gerhard Fettweis, Speaker and Panelist @ Brooklyn 5G Summit 2016. Apr 3-6, 2016 Gerhard Fettweis: Keynote “Resilient Wireless Communications – A Frontier to Be Challenged,” IEEE WCNC 2016, Doha, Qatar. 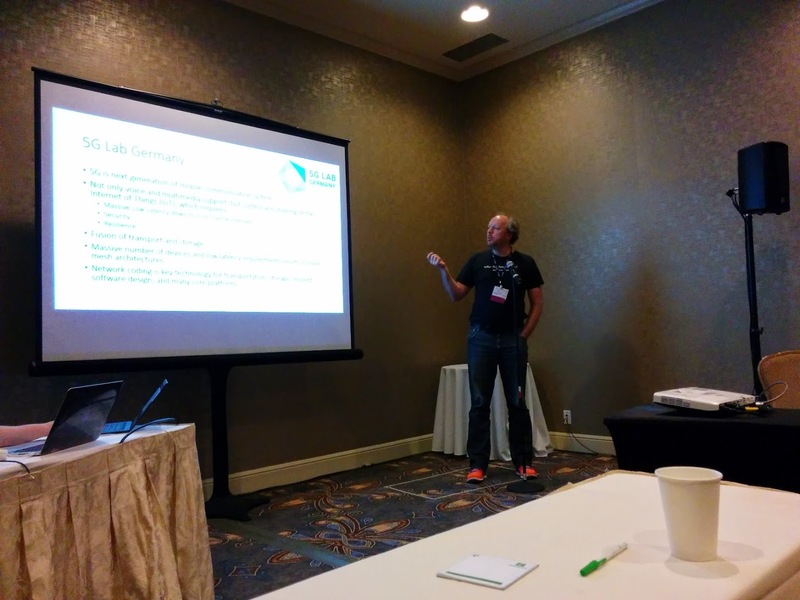 Tutorial @ IEEE Globecom 2015, San Diego, USA. Nov 16, 2015 Gerhard Fettweis, Keynote, IEEE 5G Silicon Valley Summit, Google, Mountain View, CA. June 8, 2015 “7th IEEE Workshop on Cooperative and Cognitive Mobile Networks”, Workshop @ IEEE ICC, London, UK. June 8, 2015 “First IEEE International Workshop on 5G & Beyond – Enabling Technologies and Application”, Workshop @ IEEE ICC 2015, London, UK. 5G Mobile Communications”, Tutorial @ VTC Spring 2015, Glasgow, UK.